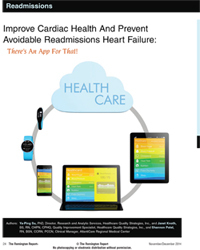 Read The New Jersey Readmission Initiative, published in Readmissions News. This article discusses the state’s improvements in avoidable readmissions. *Posted with permission from Readmissions News. Read Hospital Readmissions and the Potential Impact on Medicare Reimbursement published by MDAdvisor. *Free registration to read articles. Read Improving care transitions and reducing acute care hospitalizations, printed in the Remington Report. This article relates to the New Jersey Care Transitions Project home health experience. Read Preventing avoidable hospitalizations: implementing the Transitional Care Model in home care utilizing evidence-based practice, printed in Home Healthcare Nurse. This article describes a New Jersey home care agency’s journey in adapting and implementing an evidence-based care transitions model. Note: The receipt of any link provided by HQSI is intended solely for private, internal and non-commercial use. Copyright ownership of the work remains vested in the broadcaster, publisher and/or author, as applicable. Any requests for reproduction, broadcast, transmission or other use of this work must be directed toward the owner of such work. HQSI cannot include full content of any articles put behind paywalls by news sites that require a subscription.